Kiara 9 sited on 3-acre of freehold land in Mont Kiara, adjacent to the posh residential neighborhood of Damansara Heights, Bangsar and Sri Hartamas. 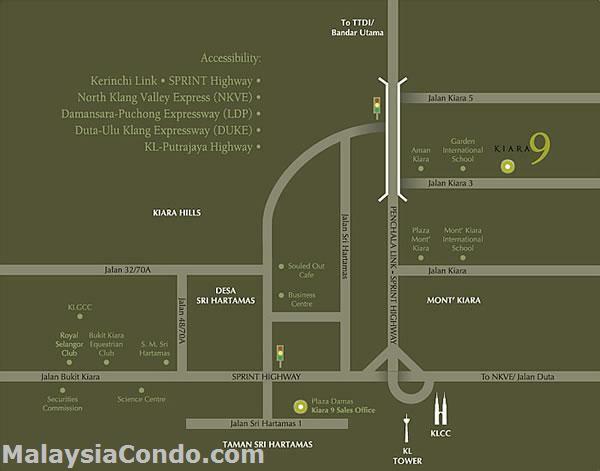 Mont Kiara is only a 15-minute drive from either Petaling Jaya or the city centre. Kiara 9 comprises 192 condominiums in a 41-storey tower and 2 low-rise blocks of 16 exclusive 3 1/2 storey Garden Villas. The condominiums has been meticulously-designed to provide generous built-up sizes and practical layouts. An exclusive lift lobby with private lift access is available for residents of units Type C.
The Garden Villas is luxuriously equipped with a private rooftop garden with a personal plunge pool, and a private lift. The spacious and functional layout within is complemented by chic designs and remarkably finished with premium quality materials.